What a gorgeous perennial this is! 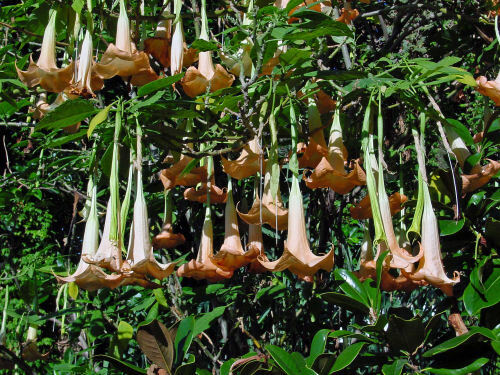 The common name for the plant is angel’s trumpet and the botanical name is Brugmansia spp. I first saw this plant on a trip to the Raleigh Botanical Gardens. I was surprised to see the plant growing in the gardens, which feature local plants that can be grown here in NC. Brugmansia is supposed to be a zone 9-12 tropical plant, happiest in zones 9-10. I guess there is hope for me that it might grow in my garden with some luck! It is easy to see why the plant has the common name of Angel’s Trumpet. The trumpet like flowers seem ready to send out music at any moment! The plant comes in a variety of colors. Some are solid colored like the Orange Cat Variety above and others have combined colored like this lovely pink and white variety from the Raleigh Botanical Gardens. 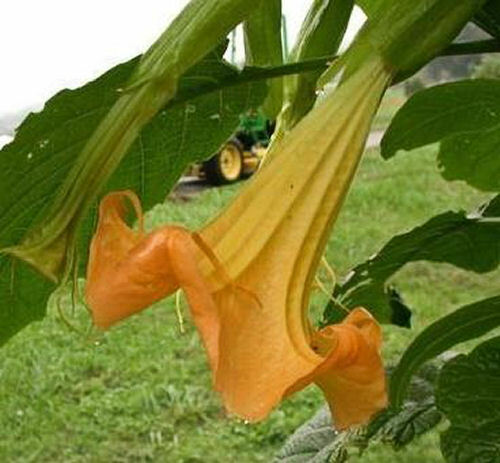 Brugmansia is a member of the hemlock family and is very poisonous. All parts of the plant are poisonous. 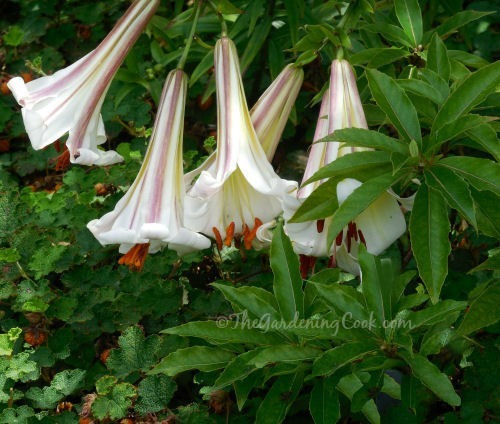 It is a good idea to wear gardening gloves when tending to or pruning angel’s trumpets. Flower color: many shades from white, peach, pink, orange and yellow. Some solid color and some striped. Flowers can grow up to 20 inches long, and are very impressive. Pruning: Pruning is essential to get the most flowers. Most brugmansias are trimmed in a tree shape. Begin pruning where the plant forms its first “Y.” It is best to prune the plant in the fall. 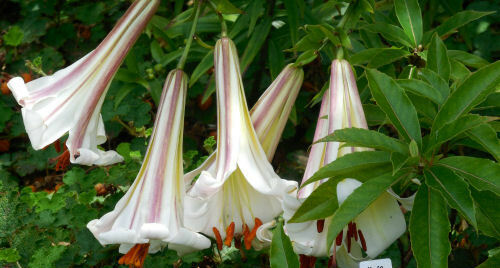 Propagation: Angel’s trumpets are grown from seeds sown directly in the soil or from cuttings. *Tip: for colder climates, where you can’t bring the plant indoors in winter, take cuttings and root them and replant in the spring to have the plant growing each year. Plants grown from seed will not flower until the second season. Watering and Fertilizing: The plant likes to be kept evenly moist and it likes feeding every 2-3 weeks during the growing season. Switch to a high phosphorus plant food right before blooming. Poisonous: All parts of the plant are poisonous. Be especially careful not to grow it where small children or pets are active. Pests: Susceptible to aphids and white flies. Can also develop root rot if watered too often. Even though the plant is a bit tropical and may be a challenge in colder climates, it is worth it to try to get a show of flowers like the one above! 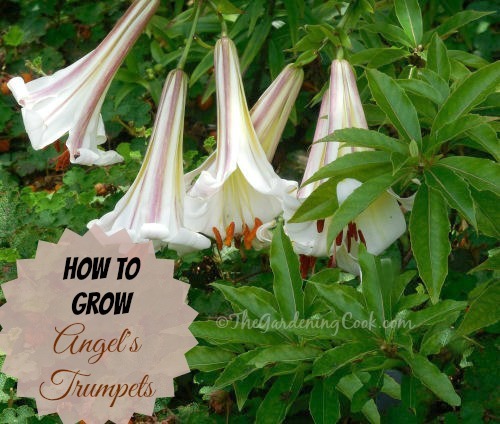 Have you had luck growing Angel’s trumpets? Do you have tips to share for your zone? I have read different suggestions on what type of light brugs prefer….I have 4 plants that are doing well right now indoors and will be moving them out…but do I plant them where they get some afternoon shade? Or where they would get warm sun all day? Hot sun on my deck? I know they are tropical, but I am in 6b, and want to know what’s best before planting, or building a spot for them…..thanks!